Umabdul is broadcast daily in 10-minute episodes, part of the station’s 24/7 schedule. Like much of Halab Today TV’s output, Umabdul’s production values are poor and it is all filmed indoors, but it represents a miracle of resistance to President Bashar al-Assad and the forces of Isis, the fundamentalist militia that calls itself the Islamic State, which has recently captured swathes of territory in Syria and in Iraq. In the last few weeks, Isis has decapitated two ­American journalists and Syrian journalists are also targeted. One of Halab Today TV’s journalists was recently kidnapped and killed by Isis; another wounded. A third, now in Turkey, only escaped Isis when his prison was bombed. Halab Today TV is part of a spontaneous journalistic movement in opposition-held parts of Syria. The station has at least two main rivals, Orient TV and Souria Al Ghad, who transmit from Dubai and Cairo. Until the revolution began three years ago, Syria had only three government controlled-national newspapers, and only state radio and TV. This media is not just documenting the revolution, it’s born from it. Agha is speaking on Skype from Turkey, where the office has 50 staff in an unnamed location. Twelve staff members are still based in Aleppo, the largest city in Syria, with a pre-war population of more than two million. It has been the scene of bitter fighting for the last two years. Estimates vary between 13,500–23,000 dead. The city is divided between Syrian government and opposition forces, and Isis massing on its eastern flank. The station focuses on news from Syria, documentaries, video footage by citizen journalists and religious programmes. “We show that real Islam is not about killing,” says Agha. Halab TV was founded in 2012 by an Aleppo businessman who wishes to remain anonymous. Before he was asked to run the station, Agha, a former factory manager, had no media experience: “None of my staff has previous experience. We’ve learnt everything from the internet.” The media revolution began in April 2011, when ­people first took to the streets. Assad swiftly banned foreign journalists; Syrians began filming the uprising on mobile phones and posting footage on the internet, or sending it to international broadcasters. “They wanted to tell the world what was happening,” says Armand Hurault of ASML (Association de Soutien aux Medias Libres), a Paris-based media NGO and implementing partner of Smart, the Syrian Media Action Revolution Team. ASML and Smart currently work with 300 people throughout Syria, Turkey, Jordan and France, supporting three radio stations, 12 newspapers and a dozen media offices inside Syria, giving video-camera lessons on Skype, providing computers, printers, paper and ink, money and technical assistance. The independent Syrian media came of age, however, a year ago, after Assad regime’s chemical weapons’ attack on the Damascus suburb of Ghouta in August 2013. “Until then, Syrians had hoped that if they posted videos on the internet, the world would come and sort it out,” says Robin Yassin-Kassab, the half-Syrian British author of The Road from Damascus, who still regularly travels to Syria. It’s difficult to estimate how many independent magazines, newspapers and radio stations there are now, as most are very local and, in regime-controlled areas, underground; some of the radio stations are only online. According to Smart, there are about 500 print journals and about 20 radio stations. In April 2011, Smart began smuggling modems into Syria to help video-activists broadcast their stories. Smart spent months training video-activists on Skype so their footage would meet international TV standards. 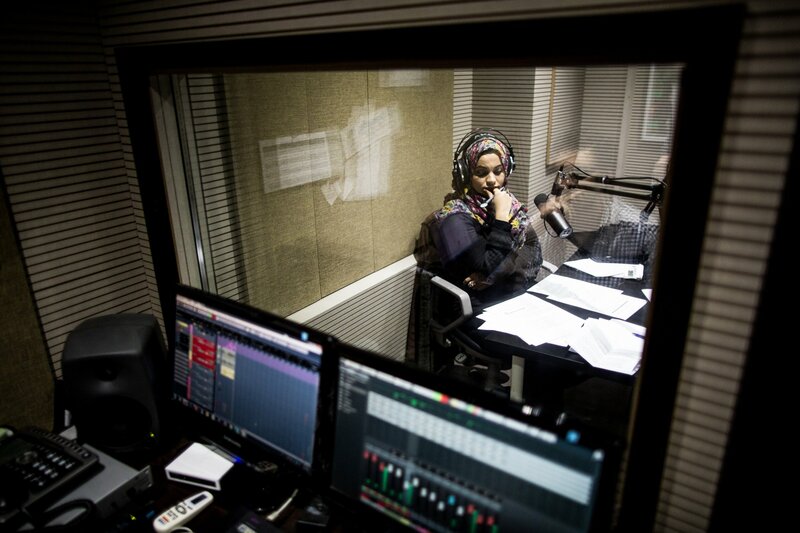 They recently set up a network of radio antennae and, earlier this year, founded their own radio station, Hawa Smart, blurring the line between supporting a free media and becoming a part of it. Smart’s offices in Syria have been bombed by Assad and attacked by Isis; one of its correspondents was killed by a sniper. Initially, the founders of Smart say, they used their own money, then cajoled family and friends to donate as costs grew. Each modem cost $1,500 and live broadcasts cost between $17 and $20 a minute. From 2012, Smart got funding from the Syrian National Council, the umbrella group of the Syrian opposition. Now funded by a mixture of private donations and NGOs, Smart declined to specify the details of its financial donors. Meanwhile, on the ground, video activism was evolving into a homegrown journalistic scene with tiny local papers and online radio stations broadcasting openly in the liberated areas and underground in those still under Assad’s control. It was driven both by a desire for information and new-found freedom of speech. 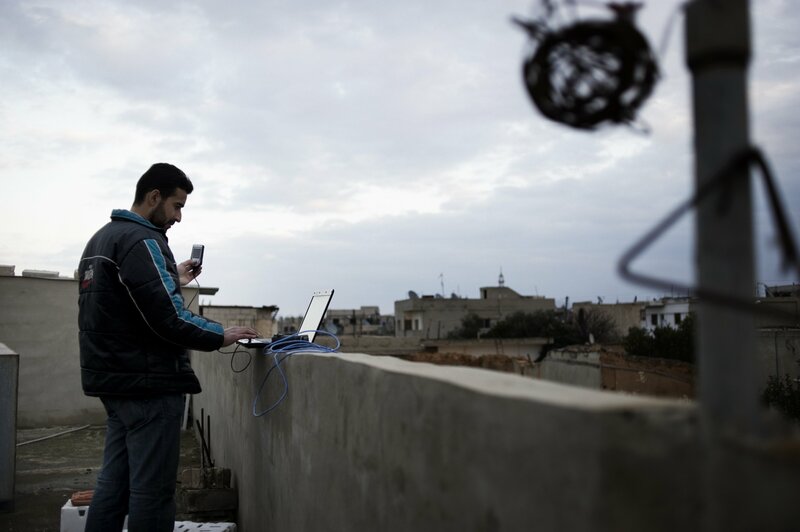 The majority of Syria’s independent media outlets, like Faris’s media centre, were originally set up and run by volunteers, who paid the expenses themselves. Extra funding came from private donations from Syrians, some abroad, some locally, slowly building up support from NGOs. As most of these magazines only have a local circulation of a few hundred, and online radio is very cheap, the costs were not overwhelming. Halab Today TV, according to Agha, is entirely privately funded by expat Syrian businessmen, at a cost of $70,000 a month – largely in cash. “I am always having to send people to Aleppo with lots of cash.” But as the war has worn on, the media outlets became more professional, their expenses greater, and Syrians themselves poorer. Faris’s funding now largely comes from Syrian Americans and the US government – who gave him the money to set up Radio Fresh. The EED helped refurbish his media centre with laptops, printers and flak jackets. According to Smart-ASML, a small publication inside Syria can be run for a couple of thousand euros a month; but a magazine with an office outside Syria, and correspondents in country, can cost up to €10,000 a month. EED’s grant to Smart is aimed at doubling the distribution of local magazines supported by Smart. Both the regime and the Islamists recognise that this nascent free press is not just born from the original secular revolution, but an integral part of its survival. Furey of the IWPR reiterated that the lines between Syrian activists and independent media are often very blurred. “We interpret this as broadly as we can,” he says. “It’s a transient community because they are under threat. Many of the people we worked with have been tortured or killed.” The political cartoonist Ali Ferzat had his hands broken by government troops. The Syrian singer Ibrahim Qashoush, famous for singing revolutionary songs, was found dead with his vocal chords ripped out. The opposition blames Assad’s forces. At Halab TV, Agha has set up strict rules to protect his staff. “Our reporters work in teams of three, but none of the other teams know each other. If one team is captured, I don’t want to lose everyone else. None of them show their faces on TV. I have software that disguises their voices,” he says. “They all work from home. We used to have an office but the regime bombed it and Isis kept coming to search it.” Halab Today TV’s two anchormen and two anchorwomen women do show their faces on TV, but work under false names and are based in Turkey. At Radio Fresh, Faris was shot by Isis and left for dead in January 2014, just after he’d come back from a high profile US tour of Syrian expats and US politicians. His media centre was also attacked and robbed in January, by Isis, he says.